Current Grade 9 English Language Learners (ELLs) * are invited to attend Youth Voices: NYC Writing Project. A program designed for ELLs with a focus on reading, writing, and digital media. Youth Voices will connect students’ academic learning with their personal passions and wider concerns. This program does not award students credit towards their graduation. 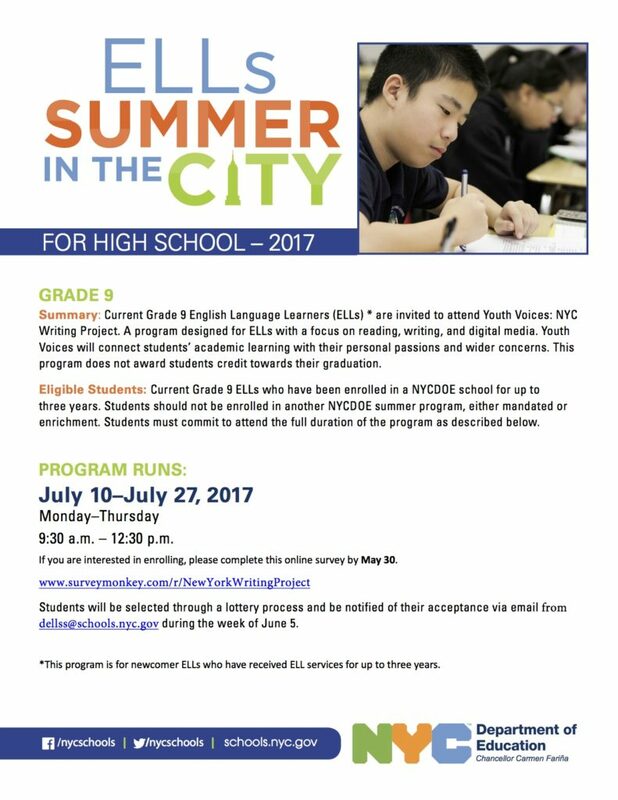 Eligible Students: Current Grade 9 ELLs who have been enrolled in a NYCDOE school for up to three years. Students should not be enrolled in another NYCDOE summer program, either mandated or enrichment. Students must commit to attend the full duration of the program as described below. Apply for the 2019 NYCWP Invitational Leadership Institute! May 31, 2019: Teens Take the MET! The NYCWP is a program of the Institute for Literacy Studies at Lehman College. Copyright © 2019 New York City Writing Project. All Rights Reserved.